This is the blog of the Archives and Special Collections of Amherst College. In the course of our daily work we often run across treasures and oddities in our collections that we want to share. We will use this space to feature both new acquisitions and materials that have been part of the collection for decades. This blog is intended to showcase the work of the staff of the Archives & Special Collections; we do not accept unsolicited submissions or other outside contributions. The name of this blog — “The Consecrated Eminence” — is a nickname for Amherst College. It was used by Stanley King as the title of his book “The Consecrated Eminence”: The Story of the Campus and Buildings of Amherst College (1951), but it isn’t clear how widely that nickname was ever used. 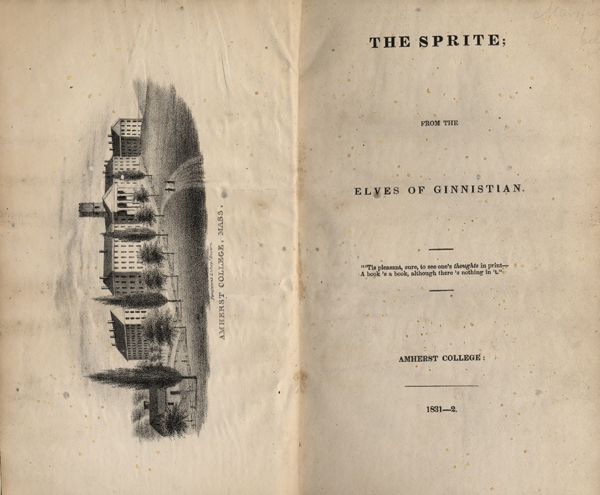 So far, the earliest appearance of the term we have found is in the earliest student magazine in our collection: The Sprite. The first issue appeared in May 1831 and the last in March 1832 — a total run of just six issues. Our habitations, moreover, are small and we are but a weak people; we therefore apply for aid to you, inhabitants of the “consecrated eminence”; on you rest all our hopes and expectations; to you we look to receive the treasures of mind, while we shall esteem ourselves happy in gathering and bringing them before the public eye. We shall act without parity or favoritism. Peter, this site looks terrific … I know I’m going to have a lot of fun browsing here! This is fantastic! I love it when libraries and museums share their collections via blogs! I am a descendant of William Ward Snell. His son, Cullen Bryant Snell, married Sarah Emerson, daughter of Elijah Emerson (whose second wife was Tirzah Snell, sister of William and Ebenezer Snell. Cullen’s aunt became his step-mother-in-law). My great grandmother, their daughter Katharine Snell, kept a great wealth of family letters and photos. I’m gradually going through these. I would love to establish a correspondence with an archivist in your college so we can exchange information. Sorry! I confused myself…Sarah Emerson married George Peabody Davis. Their daughter Katharine married Cullen. Cullen’s Aunt Tirzah became his step grandmother-in-law. How confusing it can all be even when steeped in it!